LONDON–(BUSINESS WIRE)– September 06, 2018 – The Gulf Cooperation Council (GCC) member states are forecast to spend over USD100 billion on their defence capabilities for the first time next year, with increasing budgets in Saudi Arabia and the United Arab Emirates (UAE) driving growth between 2018 and 2027. Across the Gulf states comprising the GCC (Saudi Arabia, UAE, Kuwait, Qatar, Bahrain and Oman), defence budgets are expected to reach record highs next year, with increases in spending primary focused on modernising and expanding military force structure and improving readiness in response to continuing regional instability. Jane’s Defence Budgets data says that despite predicted fluctuations in the growth rate, defence spending will continue to increase over the next five years, reaching around USD117 billion by 2023. In total, the states of the GCC are expected to spend around USD86 billion on defence equipment over the next five years. GCC defence budgets have risen as a percentage of GDP over recent years, but even more significantly are also rising as a share of government spending; highlighting the importance placed on enhancing military capabilities. A major driving factor in defence procurement plans has been the increase in operational activity by GCC militaries in places such as Iraq, Libya, Syria and Yemen. Such actions have led to an increase in spending on the development of expeditionary and intelligence gathering capabilities, as well as the bolstering of combat aircraft fleets. Despite accounting for just 5 percent of global defence spending the GCC is responsible for almost a quarter of all imports of defence equipment – importing assets worth approximately USD56 billion between 2014 and 2018. North America and Europe provide about 95 percent of all equipment acquired by Gulf states. The US alone has accounted for about half of all exports to the GCC in the last five years. However, despite the prevalence of equipment from these sources, other suppliers – ranging from Australia to China and Turkey – are increasing their market presence. “The modernisation and operational requirements of some militaries in the region are seeing some governments turn to alternative suppliers for equipment,” said Charles Forrester, senior defence industry analyst at Jane’s by IHS Markit. 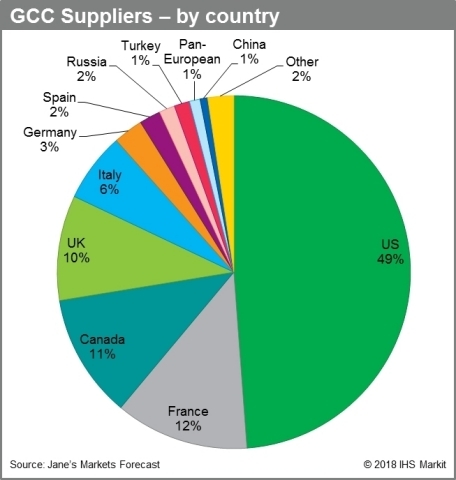 Jane’s Markets Forecast has identified USD48 billion in announced requirements and USD32 billion in unannounced opportunities in the GCC region over the next decade. Countries in the region are also continuing to leverage large defence procurements to improve domestic military and non-military technological capabilities through offset programmes. Most notably, Saudi Arabia aims to increase domestic defence procurement spending from 2 percent to 50 percent by 2030 as part of the country’s Vision 2030 goals. Both the UAE and Saudi Arabia aim to improve their own defence industrial bases to improve self-sufficiency and ensure the security of supply for their own militaries. They also intend to leverage this capability to boost exports of locally made defence equipment, with the UAE already exporting its Nimr protected vehicle to countries including Algeria and Turkmenistan.